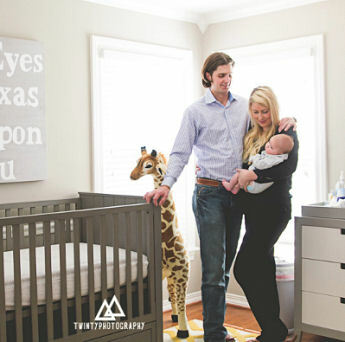 Photographer, April Rankin, captured many Texas baby nursery theme ideas in the images we have for you on this page. The pictures are filled with ideas for decorating a modern grey and white room and custom artwork that features every Texan's favorite quote. The décor presents a helpful example for DIY decorators (even those decorating a room for a baby that is not a resident of the Lone Star State) demonstrating how flexible this neutral color scheme can be. It may come as a surprise to those of you that rarely pick up a paint brush or a home decorating magazine that gray has replaced beige as the "go to" neutral wall paint color. There are warm shades of grey as well as those with cool, blue undertones but it would be safe to say that there is a color to suit every project in the fan deck at your local home improvement store. 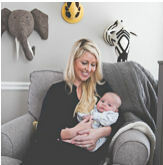 The large, toy giraffe and faux animal trophies on the nursery wall add color and interest to the space. The contrast of the zebra's black and white stripes will be one of the first things in the space that the little one notices. This modern grey and white nursery made a very attractive background for Newborn Photographer, April, of Twinty Photography. April used many features of the room as props including the giant, stuffed giraffe and the family's pet, a beautiful Great Dane. 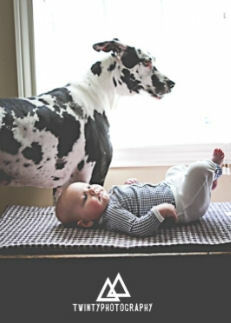 The pattern of the dog's fur, the checked fabric of the little one's shirt and changing pad are so perfect that they could have been planned. The print of the shirt that Dad is wearing for the photo shoot is a perfect fit as well. The value of a photographer with experience in the area of newborn photography cannot be overstated. April Rankin understands that pictures of a nursery are so important. The nursery features dove grey walls with the crown and shoe molding and window frames painted white. 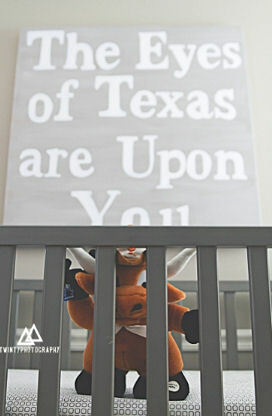 The custom sign with the saying "The Eyes of Texas are Upon You" and the Longhorn are suitable decorations for any Texas baby nursery theme. Thanks to April Rankin for sharing the results of this newborn photography shoot with Unique Baby Gear Ideas.